Catch the Delightime Party Lights on Amazon.com! BAYSIDE, N.Y. - Dec. 8, 2017 - PRLog -- G&H Global LLC, the company behind the well-loved party light brand "Delightime", has just announced the arrival of new stocks which can be expected to be available to the public from December 8, 2017 to December 15, 2017, on the biggest online retail store: Amazon.com. The company's marketing manager, Tom Huston, informed, "Due to the increased sales over the past months, our supply has not been able to meet the demand. Thus, our Delightime party lights have unfortunately run out." He also excitedly shared during the brief interview, "Customers have actually been asking us about our disco bulbs and we're happy to say that stocks will arrive at the Amazon Fulfillment Center within the week. And everyone can order their LED disco lights by then!" New said stocks include the classic Delightime Full Color Light which shines in dazzling colors of red, blue and green. It is a fun, easy-to-use and convenient substitute for mirror balls that provide the right lighting and mood to keep a party going. Furthermore, the Full Color LED light (https://www.amazon.com/dp/B00GMQ7QGC) promises superior performance through its built-in bright LED PCB and silent mini motor plus a long working life which can reach up to 20,000 hours. 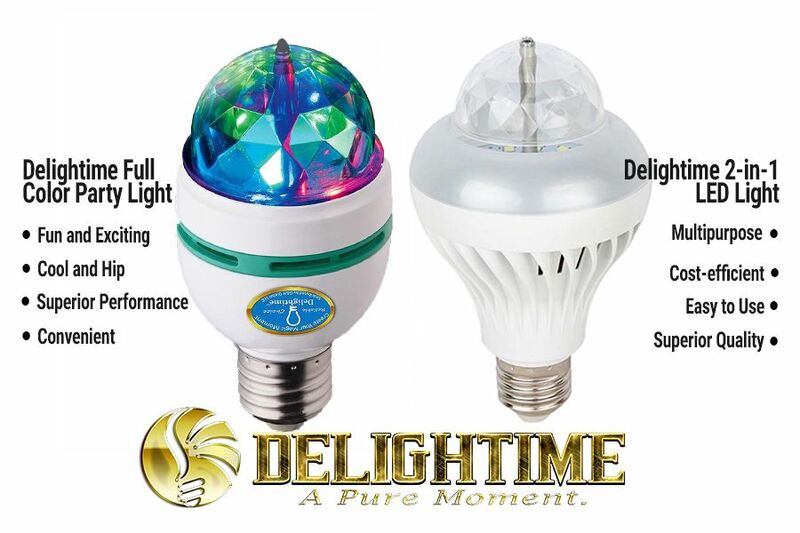 Customers can also expect the Delightime 2-in-1 LED Light (https://www.amazon.com/Delightime-LED-Disco-Party-Light/d...) to be available soon. It is a multipurpose bulb which offers both a fun party light and a regular home lighting. It has two settings: "Disco Mode" and "White Mode", which can be used interchangeably through a simple flick of a switch. It's a cost-efficient option for lighting that's made with high-quality RGB LED lights and 14 beautiful crystal white LED. Both models are covered with the company's 100% Hassle-free Money Back Guarantee where if a customer is not fully satisfied with their item, they can simply return it to receive their money back. Tom Huston describes, "We promise our customers a hassle-free, no questions asked and certainly no hard feelings process to ensure them that their full satisfaction is our top priority."